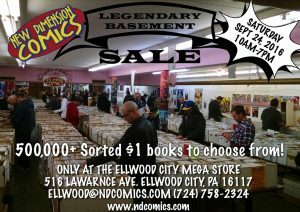 It’s that time of year again where we will be opening the basement in Ellwood City! Over 500,000 individual comics all sorted alphabetically and all $1 each! Tons of books! Come early and dig all day! One day only! ← Free Graphic Novel Day – Saturday Sept 3, 2016 – All Locations!